Mark your calendar for Saturday, June 24th… Pedal, Paddle and Play is back! Pedal, Paddle and Play is a community event that combines pedaling the Seven Waters Trail by bicycle and paddling down the Fox River Water Trail while listening to live music at selected spots along the route. The ride kicks off at 10am this Saturday, June 24th. Packet pick-up begins at 9am. You can choose your route and starting point. There are registration areas in Burlington at Riverside Park and in Waterford at Village Hall Park (maps below). At the registration, you need to fill out a registration form and pick up your t-shirt. You will also receive a map and ride information on-site. You will be cycling, paddling, or both between these two points, Waterford and Burlington. Music, water and snacks will be available at both registration areas and at Case Eagle Park in Rochester which is about halfway between Burlington and Waterford. Cyclists will stay on the Seven Waters Trail for the event https://www.traillink.com/trail/seven-waters-bike-trail/. Event signs will mark the route at road crossings and turns. Paddlers will put in at the wonderful new boat launch behind Village Hall in Waterford. Kayak rentals at a reduced rate for participants will be available through Fox River Paddle Sports located behind Village Hall Park in Waterford. You can reserve a canoe by contacting Sherri at https://foxriverpaddlesports.com/ Day of the event rentals will be available on a first-come-first-served basis. 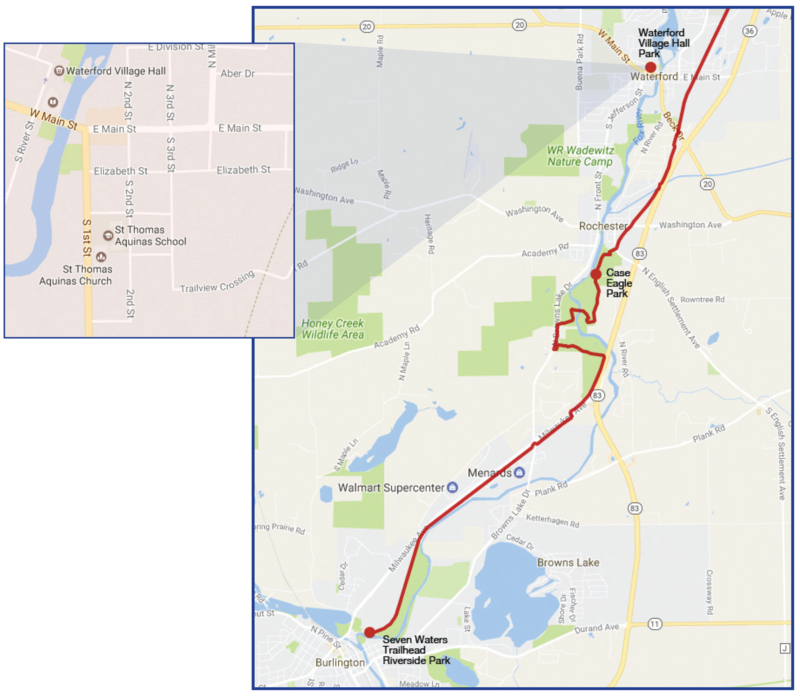 Paddle to Case Eagle Park, portage your watercraft, and continue to Riverside Park. Your craft will be shuttled by bikeburlington volunteers back to Waterford. Drop your watercraft at Case Eagle Park or Village Hall Park. Drive to Riverside Park in Burlington. Cycle via 7 Waters Trail to your boat. Drop bike with bikeburlington volunteer. Paddle back to Case Eagle or Riverside Park starting point. Your bike will be there to meet you, shuttled by bikeburlington volunteers. Cycle from Riverside Park to Village Hall Park. Drop your bike with a bikeburlington volunteer. Pick up rental kayak. Paddle to Case Eagle Park and back. Cycle back to Burlington. Bring your bike to Village Hall Park. Drop bike off with bikeburlington volunteer. Pick up rental kayak. Paddle to Case Eagle Park. Pick up your bicycle(shuttled to Case Eagle by bikeburlington volunteers) and ride back to Village Hall Park.